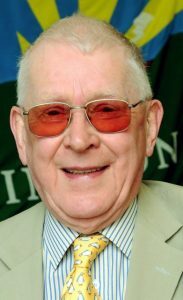 John Kershaw was born on 11th May 1934 and passed away on 26th February 2018, aged 83. He was the only child of village dentist Stanley Kershaw and his wife Ada, living all his young life in Romiley, then in Cheshire, now Greater Manchester. Despite growing up in wartime Britain, on the outskirts of Manchester, his many implausible tales always left me with the impression that he had an idyllic childhood. As a child, I quickly realised that he was a one-off. None of my friends’ parents told tales of absconding from air raid shelters, being expelled from Manchester Grammar school for sawing down the school flagpole, or owning dogs that got the bus to town unescorted, neither did any grow up in a household with the services of both a nanny and a maid! John came from a generation who were required to do National Service and he was in the RAF for just two years, yet somehow, he found a different story to recount every day for the rest of his life! The experience clearly had a profound effect on him and helped instil the sense of duty he retained all his life. During his time serving with 613 Squadron he was especially proud to have taken part in the march past on the Mall during the Queen’s coronation in 1953. As a younger man John had a passion for cars, and most of his early jobs were related to the motor trade. It was while working for Exide Batteries he met Olive when he went to visit her boss. They married in 1961 and set up home, initially in Timperley, then, after a few years living in Marple, they moved to Bollington in the early 1970s. He was a keen motorsport enthusiast and was a regular competitor, enjoying success in the fledgling sport of rallying. Much of his early working life was spent in tyres, working for Michelin in Trafford Park. He was involved in many areas of specialist tyres and, as a child, I remember the truly enormous quarry truck tyres he used to sell, towering above me while my brothers and I ran around the depot (no health and safety rules back then!). John always had an uncanny ability to get on with almost anyone, regardless of age, background, or position in life, and he made many lifelong friends and met many fascinating people during both his working and social life – in fact he seemed to attract them! I remember my first bike being dropped off by world track cycling champion Reg Harris, another friend from his days in tyres. The late 1970s were hard times for many and following redundancy, with a young family to feed, he enrolled on a business diploma course at Liverpool University. Following this, with work still in short supply, a chance meeting with a lady who wanted a table restoring led to the job most people remember him best for – furniture restoration. He was a fine craftsman and could turn his hand to most things, but it was undoubtedly his skill with antique furniture restoration and French polishing where he really excelled, and that gave him the most pleasure. That said, I can’t say he was the best of businessmen. Visits to his workshop would usually find him chatting with someone, drinking coffee, smoking a pipe and not much actual work going on! He loved Bollington, its buildings, its countryside, but more importantly, its people, having first visited as a child with his parents who would journey out to the Country Café in Spuley Lane. Both he and Olive have always been involved in community life, be this the Cubs, Scouts, or ATC, when my brothers and I were younger, and latterly with Bollington Town Council, Sea Cadets, St. John’s school, Bollington Brass Band, Senior Citizens and numerous other community groups and projects in many and various capacities. 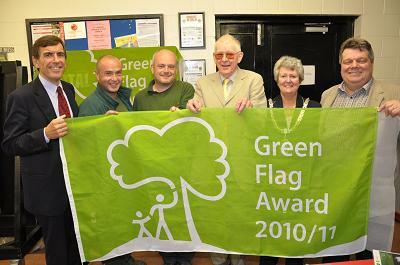 He was extremely proud to have served on the Town Council and of his year as mayor. Largely unimpressed by party politics, he genuinely was only interested in doing the best he could for Bollington and the surrounding area, and I like to think the hard work and time he and others put into so many local projects has left a legacy to be built upon in the future. 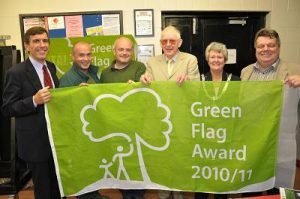 He was passionate about gaining the Green Flag Award for the Recreation Ground (picture) and also took on the voluntary role of Tree Warden. All these commitments came at a personal cost. Many jobs around the home and business went unfinished, if I’m honest, most jobs went unfinished, but he started all of them anyway. He always had a madcap scheme to interest him and many grand plans, most of which he simply ran out of time to see through. In fairness, he would probably have needed to live to 183 to finish them all, and it normally fell to Olive to maintain some semblance of normality in daily life, as well as running her own businesses. Regarding Olive, I must mention the care and compassion she has shown while looking after John, over his last year in particular, despite her own health problems. John was ill for a while with numerous conditions, undoubtedly painful and sometimes undignified for someone used to good health. Yet to his credit I can’t recall ever hearing him moan about his lot. As with everything, he simply got on with it. I have a vivid memory, aged about ten or eleven, at my grandfather’s funeral, where John told me how proud his father was of his three grandsons. I guess John came from that same era who will tell others these things but probably not tell those concerned. I do know how proud he was of all his own grandchildren. John was over the moon when Oliver got his apprenticeship at JCB and loved his rugby exploits. I know how proud he was when William was enjoying success at bike racing, and when he gained his place at Bath University. As he would always remind me, and anyone else who would listen, Hannah was the first girl in the family for well over a hundred years, her swimming, dancing, and general happy go lucky character appealed to grandad and she brought the best out of him. Just when he thought three was his lot, along came Jess, Eric and Harry, younger and with less time together, but grandad thought equally as much of them all. By today’s standards John wasn’t a role model father. His basic plan for fatherhood seemed to have been to leave us largely to our own devices and administer various corrective measures according to the level of trouble we got into, and we obliged by getting into plenty! Different times, but the basic values of honesty, integrity, and hard work are ultimately passed down by example and for that we are grateful. John lived an interesting and varied life through changing times and had a story to tell for every occasion. Time is finite, we’d all like more and none of us can truly say we make the most of every minute, but ultimately, he could have no regrets – a life well lived. The Eulogy written and spoken at John’s funeral at St. Christopher’s church, Pott Shrigley, on 16th March 2018. Standing room only, a mark of the esteem in which the community held John. Edited for this page by Tim Boddington.